Fassbinder’s famous career and infamous life both came to an end in 1982 when he was 37 years old. By then, his films were seen as clearly belonging to two distinct periods – before and after the year 1971, when he made The Merchant of Four Seasons. The crucial turning point came that year when he encountered a retrospective of Douglas Sirk films in Munich, an event that was to transform both Fassbinder’s thinking about cinema and the nature of his films. 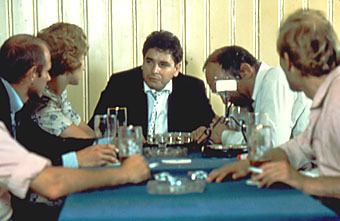 Fassbinder’s intention was to use the vehicle of the melodrama in order to make personal films. According to him, “Every decent director has only one subject, and makes the same film over and over again. My subject is the exploitability of feelings.” (2) In The Merchant of Four Seasons, Hans the fruit-vendor and “marchand de quatre saisons” (the French expression that is the source of the film’s title) is a tragic figure, despised or unloved by those closest to him, and unable to find fulfillment in a world built on materialistic imperatives. Hans’ mother scarcely conceals her contempt for his chosen profession (which “dirties his hands”), his brother-in-law treats him with the condescension reserved for an unredeemable loser, and Hans’s wife Irmgard shows nothing more than a loveless and cold duty toward him. There being no innocent angels (other than the little girl Renate) in this story, Hans continues the chain of exploitation by brutally beating his wife, who in turn takes a lover and then successfully plots to have the lover fired after he is hired by her husband. Hans’ sister Anna precisely dissects the family’s attitudes, behaviors and hypocrisies, which may position her as the closest thing to Fassbinder’s alter ego in the film. However, she is not an entirely sympathetic character, since she may have unintentionally catalyzed Hans’ suicide by stoking the fires of the family dinner-table discussion that seems to push him over the edge. Moreover, when Hans arrives at Anna’s apartment near the close of the film, she is too busy, buried in her manuscript with her back to him, to offer anything but indifference to his plight. The world of The Merchant of Four Seasons is held together by the mortar of money. Fassbinder takes delight in rigorously documenting transactions, profit calculations, accounting, haggling, expense lists, and the act of money changing hands. Even Renate’s homework problem is based on practical computations, preparing her for life in post-War Germany, a money-go-round society born of the Adenauer economic miracle. Alone on a street at night, when Irmgard is mistaken for a streetwalker, Fassbinder frames her against a shop window showcasing a symbol of middle-class respectability, a posh set of living-room furniture. Oddly enough, this scene echoes two of German émigré director Fritz Lang’s Hollywood films (Fury , and You and Me ), both of which begin with scenes of lovers gazing longingly at shop window displays. If Fassbinder uses the device as an ironic remark on bourgeois acquisitiveness and conformism, Lang’s scenes are freighted with greater sympathy (not a quality that many accused Lang of possessing), not least because of their Depression-era context. Of the impassive neutrality of expression with which the characters deliver their lines, Wenders observes that “Fassbinder wasn’t interested in showing emotion – he instead wanted to produce emotions in the viewer’s mind.” (4) By encouraging emotional identification with his characters on the one hand (through the use of an established melodramatic ‘language’) and then by disrupting that identification through various distance-creating mechanisms, Fassbinder is doing no less than showing us how to experience art. We are suspended in the work, held aloft by two opposing forces – emotional and intellectual – which we keep in delicate balance. In Fassbinder’s worldview, this is how feeling and thought must combine, ultimately (and ideally) producing action, the highest purpose of art.